I was in the hospital for 5 days. The first three on was on self-administered intravenous morphine. I didn’t like the morphine. Every time I closed my eyes I’d have horrible visions: a personalized horror movie of being cut up into pieces, mutilated and tortured. I used as little of the morphine as possible. They switched me to high doses of oral codeine on the 4th day. Here is what I remember from the hospital: My friend Maddie brought me fancy teas to drink and a book with photographs of flowers and beaches. My friend Susie spent the first night = with me. Jay brought the boys to visit. Summer, just 9 months old, was horribly sick and wasn't eating anything. Watching mindless daytime television including a cooking show where they demonstrated how to impale a chicken on a beer can and then BBQ it. My Vanderbilt Dean thought that I should bring my computer into hospital with me, that it would be a good time to get some writing done. Twelve years later I can finally laugh at that suggestion. The nurses made me walk everyday. I swore at them, but I walked. By the time I left the hospital I could walk, maybe, 40 feet at a stretch. I could get to the toilet by myself, but using it was excruciating. My bladder remained frozen from the morphine and I was self-catheterizing to pee when I left the hospital. I was afraid the bladder damage might be permanent. Opiates really bog down my digestive track. All I wanted to eat was prunes and prune juice, just to keep things moving along. When I had a normal pee I sang halleluiah. Some friends flew out to Tennessee to help out. Doris, Kate and my Mom each came to stay for a week, one after the other. They helped me through the worst of it. They’d bring Summer to me to snuggle, help get the boys down to bed, help with dinner and cleaning and all those normal life things. They rubbed my feet, my back and my shoulders, helped me in and out of the shower. (Thank you! Our house was laid out in a circle and my exercise for the first few weeks was simply to walk the loop inside my house every few hours. When I finally made it outside and walked to mailbox I considered it a major milestone. To keep myself entertained I did 'bed yoga,' read books, watched TV, and felt guilty for not writing like my Dean expected me to. I slept as much as I could. Recovery was slow. I did my physical work religiously: walking, abdominals, physical therapy, stretching. I wore a full body brace for the first 6 weeks. I remember someone who had had the same surgery telling me “I still use the brace when I do heavy lifting.” That scared me, I did not want the brace to become a permanent fixture in my life. I did gradually get stronger, I could walk farther and do more. My life began to look normal. But I still had sciatica. In addition I had peripheral neuropathy that I didn’t have before the surgery. The sciatic nerve must have been injured in the surgery. The neuropathy resulted in numbness and ‘voodoo’ pains in my left foot: sudden sharp shooting pains between the long bones of the first and second metatarsals that would stop me in my tracks. I wore a brace on my left foot for a quite a while. I didn't stop wearing it at night until 2004. The orthopedist said that it would take a year to completely recover. At the end of the year he pronounced me better, prescribed amitriptyline for the lingering neuropathy, celebrex for the back pain and dismissed me from his care. I guess I felt better than I had before surgery, but I didn’t feel great. My life appeared normal, but I wasn’t who I wanted to be. I was depressed and grieving my old body. I was still pretty weak. I still had sciatica and back pain. I couldn’t sit for more than 30 minutes at a stretch. I couldn’t stand still for more than 15 minutes. Movement, slow movement, felt best. I wasn’t in good health and could not embrace my job. In fact, I struggled alot with my job because it was so painful to sit at a desk all day. My frustration with the orthopedist and where he left me drove me first to a therapist (officially diagnosed with situational depression.) and then to better self care. 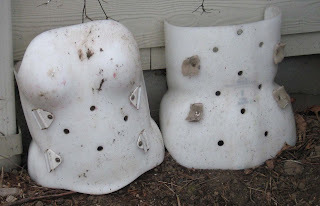 This is the remains of my body brace, with the straps removed, resting quietly in the garden. I'm thinking maybe I should add a cross over them to mark their passing.